Pressure cooking creates an authentic Tuscan soup in minutes. For the soup, heat the oil in a heavy-based saucepan over a high heat. Add the bacon, then season and fry for 3–4 minutes, until caramelising but not burning. De-glaze the pan with the sherry vinegar. Add the red onions, carrots, garlic, celery and leek and cook for 8–10 minutes, or until softened. Stir in the potatoes and tomatoes, then add the rosemary and thyme. Squash the tomatoes with a wooden spoon. Bring the pan to a simmer. Heat the beef stock in a saucepan over a high heat. Add the pasta to the vegetables. Once the stock is simmering, pour this in too. Pour the soup into the pressure cooker (CAUTION: Please follow the manufacturer’s guidelines for safe use of your pressure cooker). Bring up to pressure and cook for 5 minutes at pressure. Turn off the heat and slowly release the pressure. Remove the rosemary and thyme and discard, then stir in the cannellini beans, broccoli and spinach and allow to soften in the residual heat for 5 minutes. Meanwhile, to make the pesto, grind the basil and wild garlic in a mortar with a pestle or food processor to release the natural oils. Then, add the pine nuts and grind. Once combined, add the olive oil to make a paste and grind in the Parmesan. Add a squeeze of lemon and season to taste. 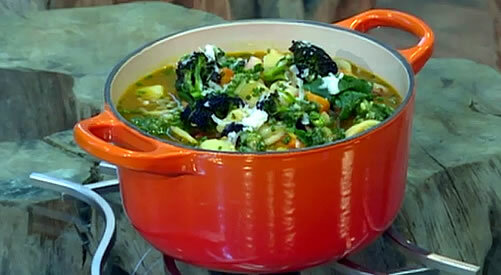 To serve, pour into soup bowls and sprinkle over the fresh herbs, parmesan, wild garlic pesto and olive oil. Serve with crusty bread.